This is the main stage for Night of Joy. Here is where the headline performers play. 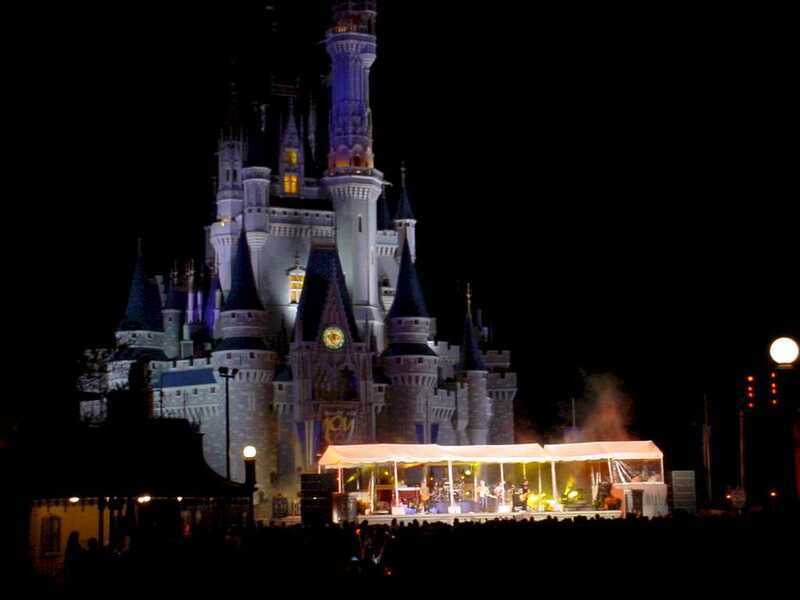 The stage is located directly in front of Cinderella's Castle at the end of Main Street U.S.A. This stage has the biggest performance area of any of the stages at Night of Joy. In 2006 the area directly in front of Cinderella's Castle had been completely remodeled. There are no more curbs and all planters have been moved to ground level. While this does allow larger crowds better views, there is less space if anyone wants to sit during a concert as there are no more planters to sit on and there is a very minimal amount of benches to sit on. Most benches are now closer to the other lands' entrances. If you do not mind a somewhat distant view there are a few places with tables which are Casey's and the Plaza Restaurant on Main Street and the Tomorrowland Noodle Station (formerly the Tomorrowland Plaza) and the far side of Cosmic Ray's Galactic Cafe. These locations will also usually be limited by trees in the sight lines as well as the fact most will be in use by patrons of the restaurants.